SMART works with industry and community college partners to design/update ARM pre-apprenticeship training materials that foreground and measure ARM industry competencies. Level 2 pre-apprenticeship training materials for SMART Educational Partner Network partners. An Electromechanical Systems and Debugging Certification course that is designed to prepare technicians to install, integrate, and debug ARM systems. This project builds on data collected in 2017 via surveys sent out to ARM member companies and Robotics Corridor data collected from nearly 40 regional robotics and automation companies from 2007-10 (see the table directly below) to develop mechatronic/robotic associate degree programs at CCAC, BC3, and WCCC. 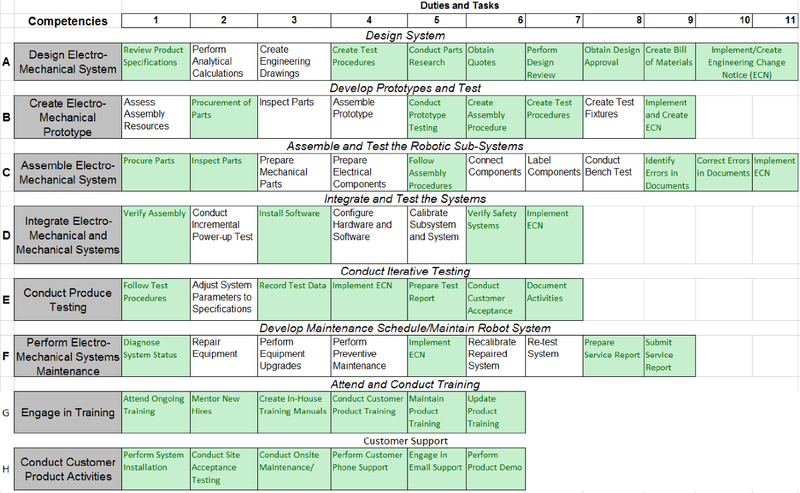 Pictured: An aggregated table of the competencies and tasks identified via DACUMS, site visits, surveys, and interviews during the Robotics Corridor Project. Competencies are found on the left and the duties and tasks that make up the competencies are found on the right. This type of data, as well as new data collected, will be used to develop pre-apprenticeship training and assessment tools. The level 2 pre-apprenticeship training materials foreground the development of SMART systems integration and debugging skills and will be divided into introductory through advanced labs. The labs and design challenges will be built around a combination of the Raspberry Pi and other off-the-shelf nonproprietary technologies that include various types of electromechanical actuators, sensors, electronic components, wiring harnesses, and proto-boards for example. All course activities will require students to communicate and collaborate, access information via the internet, read and interpret schematic diagrams and drawings, crimp and solder, use precision measurement tools, meters, hand tools, and procedures that are used every day by SMART technicians. The labs and support materials will be available online for ARM EPN members to use in their pre-apprenticeship training programs. The Raspberry Pi provides the flexibility to develop advanced labs that can directly emulate the types of activities that technicians will be required to perform in ARM member companies The Systems Integration and Debugging Courses will include a capstone electromechanical systems project that the instructor and student agree on and a rubric designed to ensure that the project meets certification requirements. SMART will provide several example capstone projects that can be used as examples, but ideally, the college faculty will be working with an industry partner and select projects that benefit community college partner’s regional companies. Students that successfully complete the program will earn a “SMART Systems Integration and Debugging Certification” which could be part of Level two of a Stackable Credential model. The example courses noted above are from Community College of Allegheny County’s Mechatronics 1 yearlong certificate program.